Roger Christian was one of the people responsible from bringing audiences the look and feel of the original Star Wars movie. Following George Lucas's vision, Christian was instrumental in providing the sets with a "used" feeling that was unique in the sci-fi genre before this point. Sci-fi normally meant white, shiny clean room sets and crisp new, straight off the production line, robots and weaponry. But Lucas envisioned a universe that was more like how a genuine space exploring society would really be, with old and used equipment and locations and sets that were in disrepair. Christian, and his team, set about designing everything for the shoot from the ground up. Things that can normally be bought wholesale on any other genre had to be painstakingly designed and signed off. With the meager budget on offer it's quite obvious that the people involved did this more for love of their craft rather than any financial reward (although they were obviously paid for their work). And you have to remember this was an unknown project that was bucking the trend for what a sci-fi shoot should look and feel like. If you stop and think about, just a second, how many props and locations are involved in Star Wars, then you'll have some idea of the issues involved. Then take into account the various crew members who didn't understand what Lucas was trying to achieve and in all honesty it's a wonder that the movie was ever completed. 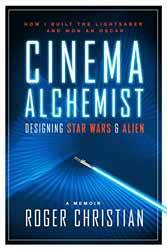 Cinema Alchemist is not a book that talks about what went on on the set (unless it involved factions of the crew who were not helping Lucas to create his vision). There's only a splattering of anecdotes about the actors, whom Christian had little contact with. This is obvious, as once shooting commenced Christian would have been elsewhere dressing another location in preparation for the cast and crew. It is obvious, however, that he had a respect and appreciation for Lucas's vision. He comes across as incredibly loyal to his directors, which is surely an essential element of any person wanting to work in the business: You're employed to see through the director's vision, not produce some sort of self fulfilling ego boost. But all to often, sadly, we hear about the ego of individuals on movie sets. Star Wars takes up the first half of the book, with the remaining pages concerning his work on Alien, Monty Python's Life of Brian, Black Angel and two and a half pages on his involvement on Return of the Jedi (which was actually one of the highlights for me). If you want to know who they captured the Jones the Cat locker sequence and the iconic chest bursting scene in Alien, then you'll find some amusing tales here. You'll also discover the pressures that Ridley Scott was under from the powers above. Christian's writing style is easy and fluid - even if on occasion he has a habit of repeating himself a little too often. There's the odd passage which reads as though he's stopped writing, due to some interruption, and then picked up the pen and thought: "Where was I? Oh, yes..." And then started retelling the same tale. It only happens on a handful of occasions, but it's a little distracting. If you're a big fan of the original Star Wars movie and want to know a little about how the props and sets were created, you'll find this a thoroughly enjoyable read.